When installing product in Dynamics GP, the common procedure is to drop a .cnk (chunk) file into the Dynamics directory and then launch Dynamics. Generally, that's all there is to it. The app grabs and imports the .cnk file and we're done. New code must be included in the :C:Program Files (x86)/Microsoft Dynamics/GP XXXX/Dynamics.set dictionary. Do you wish to include new code now? Occasionally, the process does not work. This thread will walk you through several troubleshooting techniques that will help to resolve this. What do you do when the remember user and password box is grayed out? Violation of PRIMARY KEY constraint 'PK_eConnect_Out_temp'. Violation of PRIMARY KEY constraint 'PK_eConnect_Out_temp'. Cannot insert duplicate key in object 'dbo.eConnectOutTemp'. The duplicate key value is (Sales_Transaction, INV00623393, 3, , , , , , , , , , , , , ). Can anyone provide me some sample VBA code to default the hide/show button to show on scrolling windows in Dynamics GP? Is there ANY WAY to get the date someone actually applied a payment or credit memo to an invoice in GP? I have a client who is looking at RM20201 and needs to know WHEN it was actually applied, not the end user's desired apply date. There is no created date for an apply record - or is there? I'm not speaking about the created date of the payment or credit.... but the created date of the APPLY record in RM20201 (if it exists). If it doesn't exists, how can I get it? 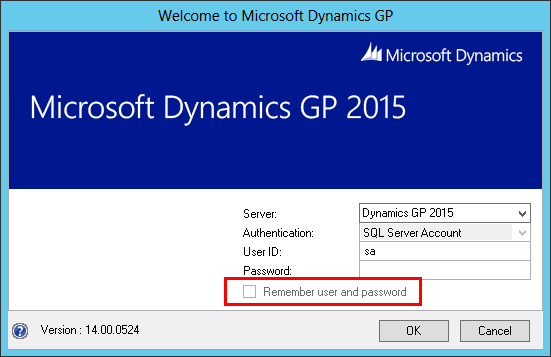 What is the best method to Update PO using web-services in GP2013 SP3? First off let me say I am new to VB and my knowledge is rudimentary. Furthermore I am trying to pick up fixing someone else's code that I did not write. I apologize in advance for anything I do or say in this question that is frustrating or incomplete - it's not intentional and I'm happy to correct whatever faux pas I may be committing! The full code (which I've included below) is a stored procedure we that pulls Extender data onto a GP report writer report (among other things). I am not receiving any errors, the code runs fine. However, when the Extender date fields print they print like this: DD/MM/YYYYYYY (for example 02/08/2016201) - in other words, the year data repeats. What do the numbers 10, 101 and 120 indicate? What is the significance of "convert" and "CHAR"? Why is the data type varchar instead of date? Would formatting these fields as a date solve my problem? The full code for the stored procedure is below. I was given a request by our finance department to find all available GL account numbers filtering by segment two. I naturally looked at GL40200 to see what was available by segment, however our finance department routinely activates and deactivates posting accounts. So what I found was that not " used " were actually accounts that had descriptions and were simply marked as inactive, so these were not what I was looking for. I am trying to fulfill this request to assist our entire finance team in a massive way I am told they will need to know over 7400 accounts to be setup for internal reporting to our parent company. I am honestly not sure how this would be possible without some sort of logic to locate all available accounts that have never been setup, I am looking for all available second segments in all nine of our companies. But not sure how to query something that has no record yet created. 10100-25001-05679	" this should be available for usage" this is the type of info I am trying to determine, I would expect a massive list of potential account numbers. I was wondering if its possible to house two different versions of GP in the same SQL instance. My company is currently running GP2010 and we have acquired another company that is running GP2013. I have the backups from our acquired company and was wondering if I can house these databases on the same SQL 2008 R2 server as my GP2010 databases or do I need to setup a whole new server with a fresh installation of SQL installed. This may be a dumb question but couldn't seem to find anything for research purposes. Does Microsoft Dynamics GP 2015 have the ability to produce an NSF Letter that can be mailed to the customer? I know you can process an NSF Charge, but we've never done letters up till now. If so, anyone want to share briefly where I go to set these up? We have a legacy version of SOAP WSDL and We have experienced problems with Sales Documents. We have no document creation errors but the money amounts always are 0. We want to use the Econnect Stored Procedures to create our invoices on GP. Please could you point me the calling order for this Stored Procedures and/or examples about this? |And here is the XML that I submitted. I am almost there, I am just overlooking something! So I need to figure out what to add to my code in order to get these populated. // Serialize the eConnect document object to the file using the XmlTextWriter. Hi, I have a proc that calls the [taPopRcptHdrInsert] to create full Shipment/Invoice transactions in GP10. On some transactions it doesn't insert the header (in my larger script), but if run just that proc with the desired variables in Query Analyzer, it creates the record. Any ideas on how to troubleshoot this? No errors and I'm calling the scripts from SQL (no XML or .NET). The procs report success in all situations but sometimes no header record for my POP receivings invoice appears unless I then go manually run the script by itself. Is there something else we should be calling or anything we are missing? ?